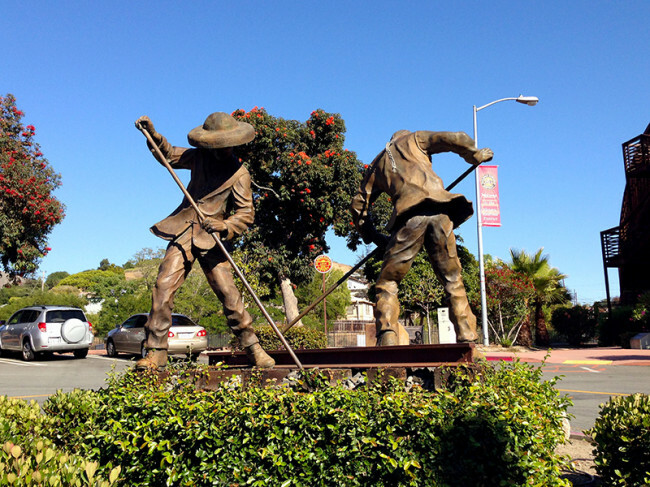 Located just in from the coast and between San Francisco and Los Angeles, San Luis Obispo is a small city that sits right on the Pacific Coast Highway, just inland from the ocean. After several days of poking around in Monterey, we headed down more of the famed PCH and made SLO our next stop. To be honest, we didn’t really stop here for any particular reason. We knew we’d have a leisurely ride down the coast that would take longer than that distance should normally take, and we knew we needed to start cutting inland and making our way east to Arizona. So, we basically looked at the map and decided that San Luis Obispo would make for a nice few days’ rest before we wandered into the desert. SLO is essentially a college town, home to Cal Poly and plenty of folks who want a laid-back lifestyle and a short drive to the beach. 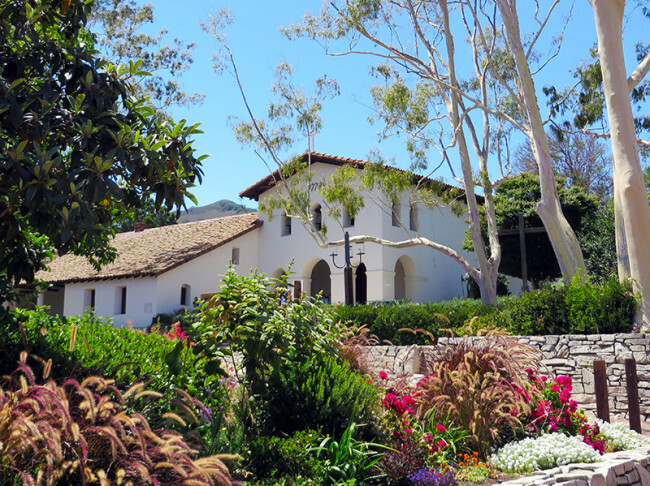 It’s actually one of the oldest cities in California, founded in 1772 with the arrival of missionaries and the beginning of Mission San Luis Obispo de Tolosa, which now sits at the center of town. Disclaimer time (once again): This is merely a blog post about what we did when we were in the area during our “Fabric of America” tour. It is full of our observations and experiences. It is not a definitive guide. It is not a guidebook. There are no attempts at either. So, if you have suggestions about things other people should see, or hate things we did or didn’t do, you are more than welcome to leave them in the comments. We encourage it, even. 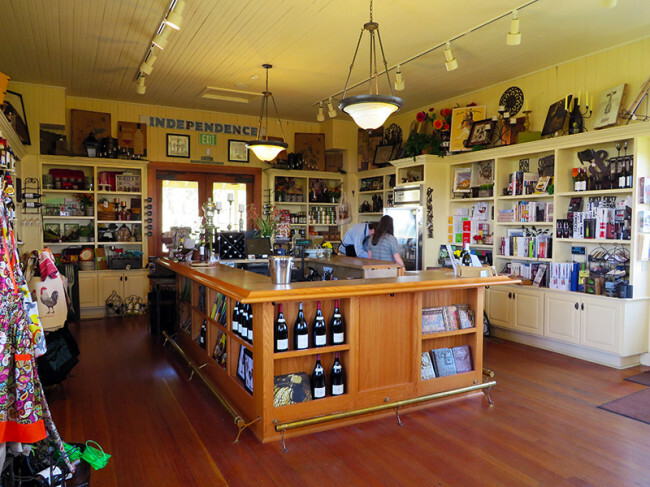 However, this is not completist and by no means do we think it’s the end-all, be-all of what to do in San Luis Obispo. We had X days. And we did Y things. Because we wanted to. Some are great, some are just okay. Got it? Good. As we always start these ‘reports,’ we had to get there first! Once again, it’s pretty easy when you’re driving the PCH. We left from Monterey late in the morning, dodging summer traffic and making umpteen stops to take pictures along the coastline. You will do the same, until you realize that you can only take so many pictures of the coastline. Directions: Drive down the PCH from Monterey to San Luis Obispo. You really can’t get lost. There are plenty of options for all ranges in SLO. We chose to stay at the Motel 6 just off the highway, because it was decently priced and one of the few hotels that allow little doggies. While they are a supporter of our “Fabric of America” tour, we covered this one ourselves. It doesn’t matter if you’re just outside of town, because there’s a 99.9% chance you’ll never go to San Luis Obispo without a car. Getting around on four wheels is easy and quick, and you can be in downtown SLO in a matter of minutes. The hotel won’t wow you by any means, as it’s not fully renovated to the new Motel 6 standard. Alas, it was completely fine for a few days and the staff were all very helpful. 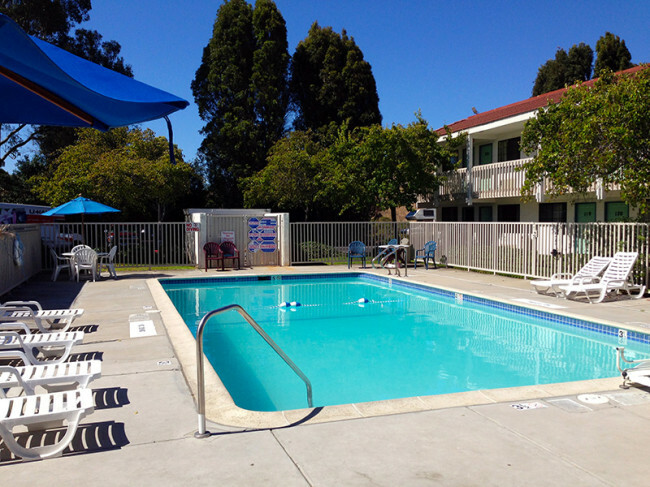 We also like the central courtyard in the property, where you’ll find the pool if you feel like having a swim. Nom nom nom. You know we love a good meal! 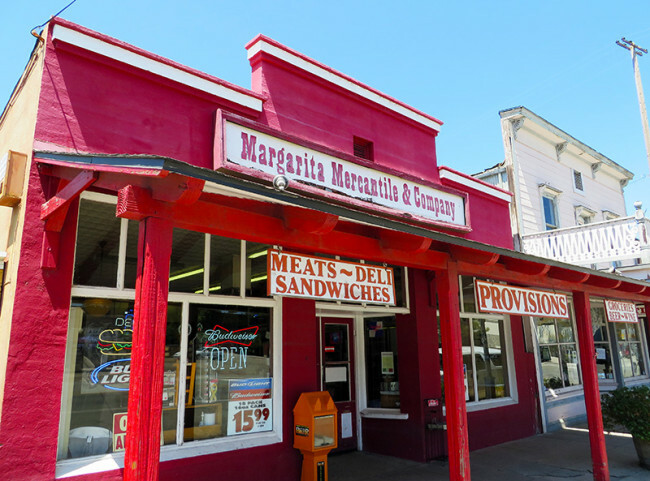 Margie’s Diner: This joint has been around for years, now serving people at three locations with oversize portions and plenty of attitude. If you can picture the stereotypical American plate, you are picturing Margie’s Diner. Fortunately, the food here was great and most certainly above greasy-spoon quality. It is located across from where we stayed, so it made for an easy dining decision after a long drive and a lack of interest in driving some more to another restaurant. Everything here is as big as your head, but that doesn’t take away from the quality of what they’re throwing down. The only real downside is that the plates are so big, we had no room for milkshakes and malts and nearly needed to be wheeled back to our hotel room. 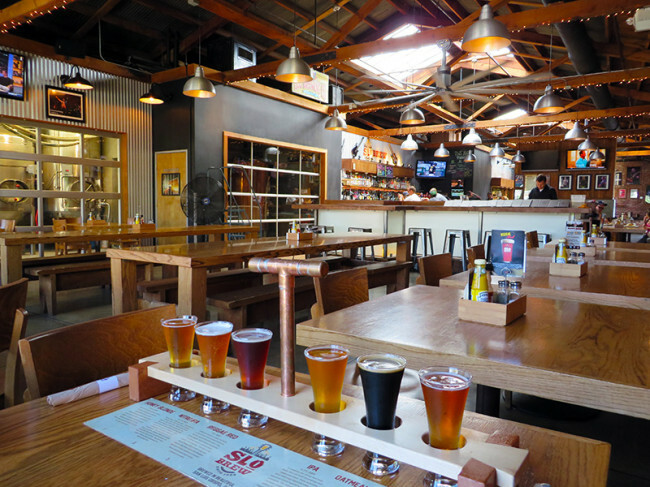 SLO Brewing Company: There is more than one brewery in town, which isn’t a surprise in most of the populated areas of the U.S. these days. 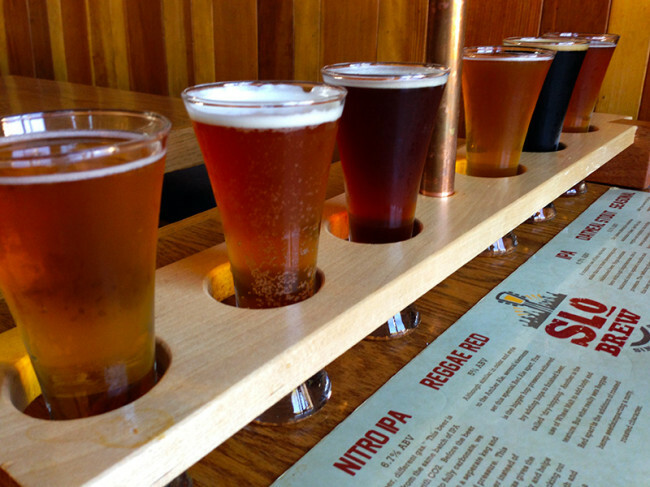 I’m not particularly sure why we chose SLO Brew, but it made for a decent afternoon stop for some snacks and flights. 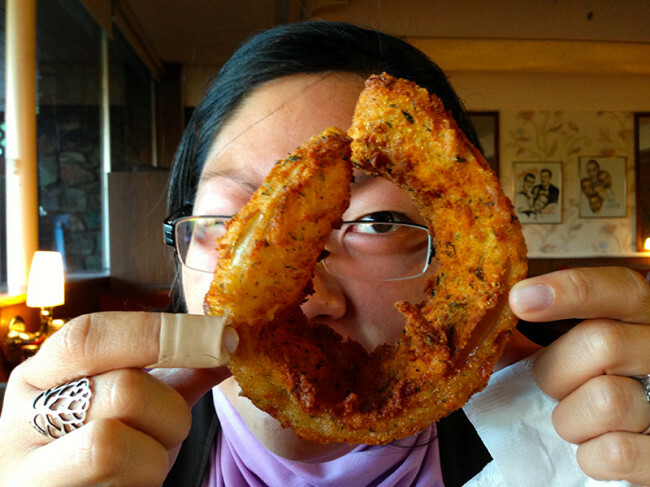 Because, who doesn’t need to get half-lit and stuffed with fried goodness in the middle of the day? If we’re being completely honest, neither of us found most of the beers here to be all that great. Most of them were lacking flavor or a bit too melodramatic – nitros are a waste of time and blueberries do not belong in beer – but we still had a good time sitting in the second-floor lounge, chatting with our server and looking out the window at passersby below. SLO Brew is also a mecca for performers – both up-and-coming and past-their-prime – and you’ll find concert posters on every wall, of every act for which you hold a certain nostalgia. We’ve seen too many concerts in our day, so we passed up sticking around for a show. All in all, it was a good stop. But to be perfectly honest, the food was better than the beer. Shalimar: If you’re a child of the 70s or 80s, you’ll probably think of this when you think of Shalimar, never mind the different spellings. Of course, the name of this Indian restaurant has nothing to do with 70s soul, but that’s what’s in my head regardless. 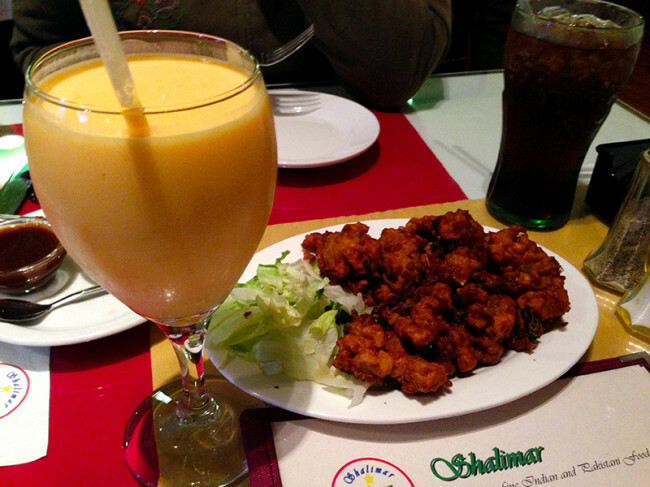 This place is regularly voted the best Indian joint in the region. And we love Indian food. So, you know we had to check it out! 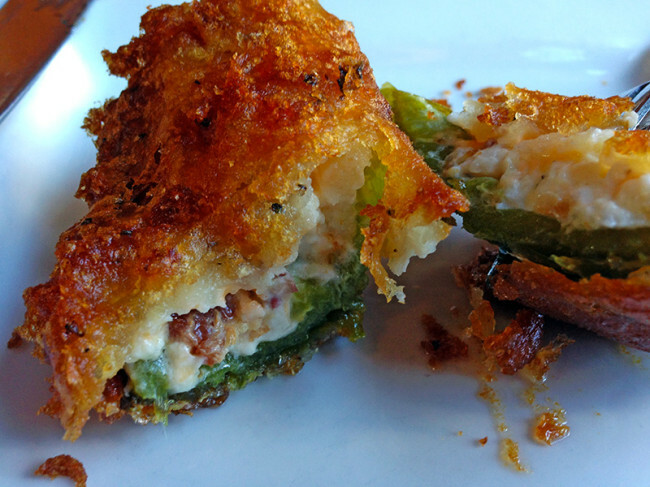 We probably could have eaten the veggie pakoras all day, and all of our dishes were excellent. The heat was unfortunately a bit on the American-palate side of things, but it was all still worth it and we recommend a stop there if you’re in town. 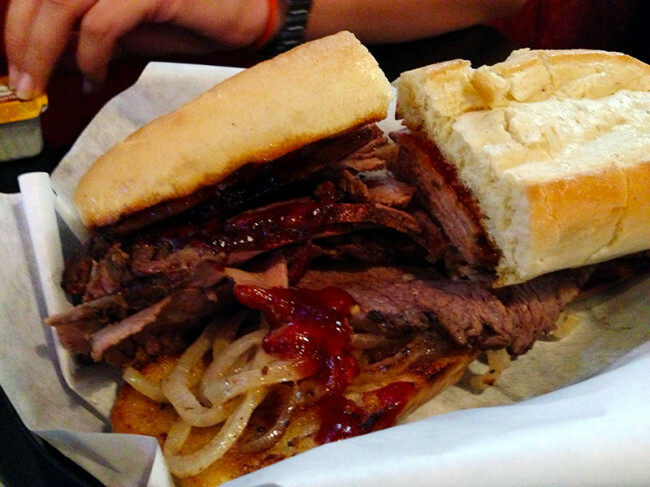 Firestone Grill: Apparently, it’s all about tri-tip. 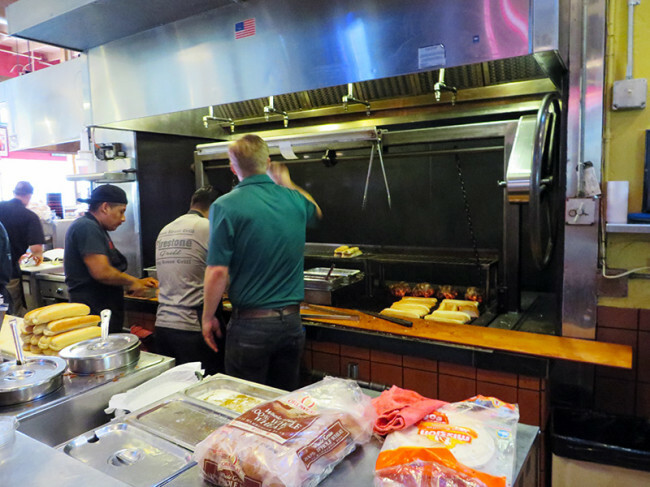 This entire region is known for its love of the bottom-sirloin steak sandwich, and we were told that Firestone is the place to get the best one. You can get it with a variety of toppings, and we chose to go with caramelized onions and barbecue sauce as that seemed to be the classic setup. Honesty prevails, though, and everything seemed a bit tough or possibly overcooked. Maybe that’s the way folks like it, or maybe they were having a bad day? Who knows. The flavor was on-point no matter how you slice it, but we prefer to save all the extra jaw work for laughing at ourselves. Chewiness is not next to any sort of godliness when it comes to the act of eating. We’d recommend it nonetheless, because I do kind of feel like we maybe just got a bit unlucky with ours. Literally 99.9% of all people we talked to who live there told us that there is absolutely nothing to do in San Luis Obispo. We hate that, because it’s mostly false no matter where you are. We decided to walk and drive around anyway, exploring the nooks and crannies of the city and its outskirts. So, here’s what we got into during our few days in SLO. There are plenty of other options as well, especially if you’re younger and enjoy a bit of bar-hopping. Visit the Coast and Hearst Castle: We spent plenty of time along the PCH, so we didn’t head back out to the coast while we were in SLO. We only drove by the ridiculous Hearst Castle, because it’s one of those setups where you are forced to park a very long way from the actual building, and pay to take a bus to it. There will be no walking around the grounds for you unless you want to cough up some dough. Frankly, dropping a minimum of $25 per person to see one of the most ostentatious exhibitions of wealth and oppression in all the American West just seems oddly paradoxical. No thanks. But we did see it from the PCH and that was good enough for us. No matter, as you can freely explore the magnificent coast in this region, and it won’t cost you a dime of money or dignity. There’s plenty to see, from the towering Morro Rock in nearby Morro Bay, to elephant seals gathering along the rocky coastline, strutting their stuff for tourists like you and us. 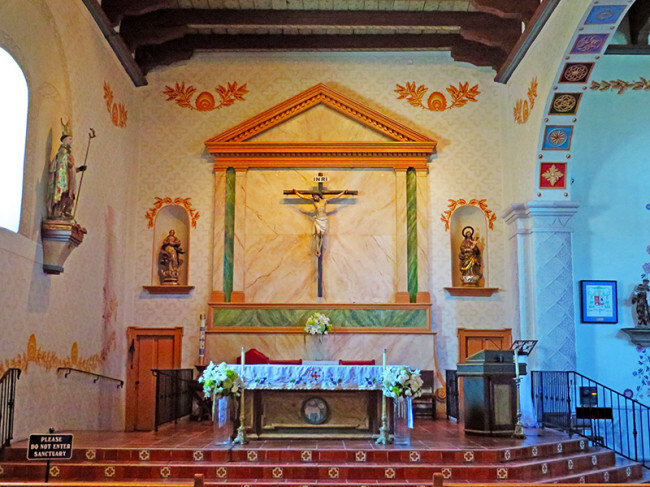 Mission San Luis Obispo de Tolosa: Founded in 1772 and therefore older than America itself, this mission sits at the heart of downtown SLO and is a centerpiece of the Spanish and Mexican colonial history that shapes the history of California. 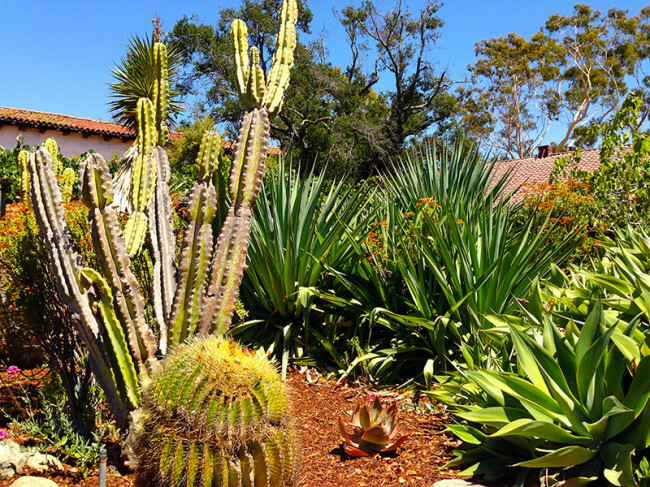 It’s by no means the largest or most beautiful of the Spanish missions, but it provides a nice walk around its small but pretty gardens. There’s also a museum inside that lends a look back in time at how the mission used to be, and imagination can easily take you back in time to think about how this place was over 200 years ago. Just outside, there’s a small river that runs through the heart of downtown, completely protected by overgrowth put paved with a sidewalk that allows you to walk part of its length and feel like you’re not in a city at all. Bubblegum Alley: I have just three words for you: Oh. So. Nasty. It’s all kitsch but it’s a well-known part of the city, this too-narrow walkway between two streets that’s entirely covered in used chewing gum. A friend asked if I showered after we walked through it. I did not, but I sure felt like doing so! Railroad Square and Chinatown: We were told we should visit the historic railroad district. Sounded like some great architecture and a glimpse back in time. 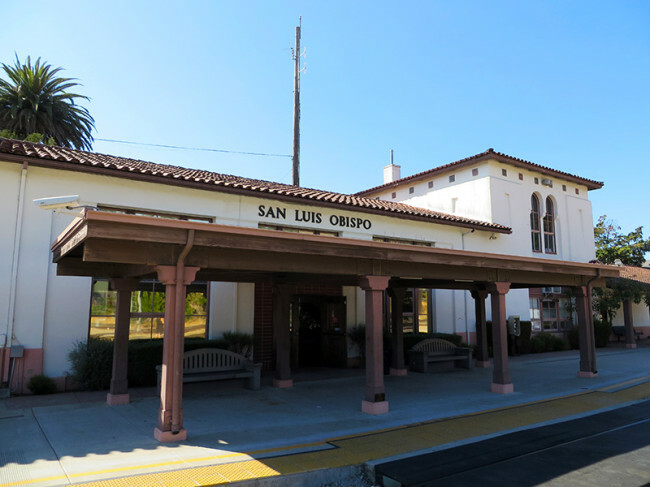 What we actually got was a fairly nice, old railroad station with modern passenger service, and a few older buildings that were once part of SLO’s small Chinatown neighborhood. We were disappointed to not find a whole lot here, but it was a nice day and we walked around snapping photos regardless. 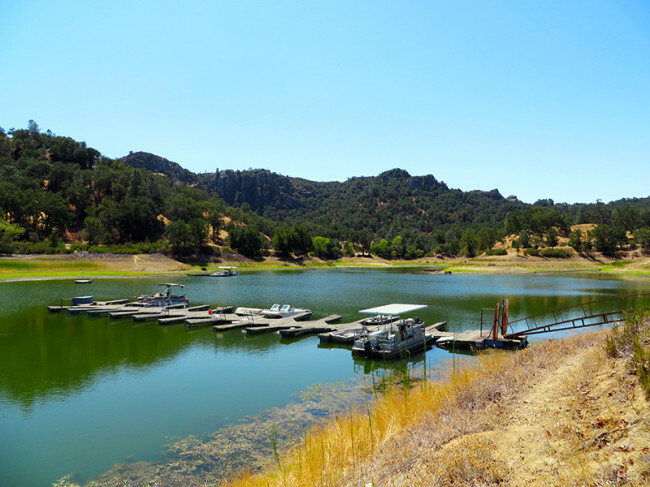 Santa Margarita and Santa Margarita Lake: Itching to explore a bit more, we decided to head out one morning and drive northeast to the small town of Santa Margarita. There’s not a whole lot to see here other than a couple of saloons and antique stores, but we enjoyed walking around and talking to locals about their town and why the heck we were there. 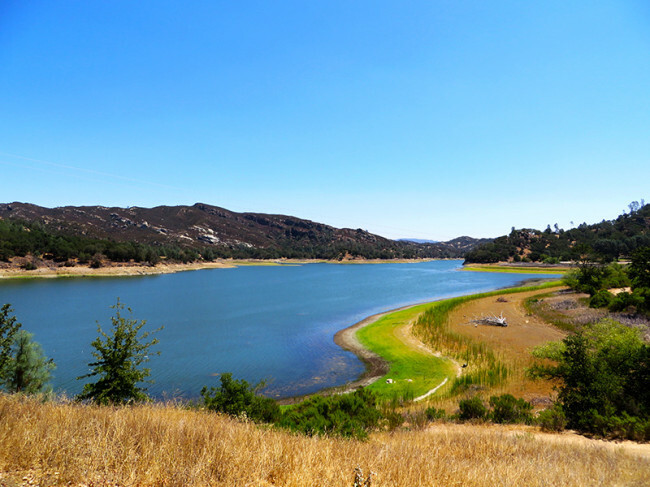 We also headed east out of town on a road that didn’t even show up on our GPS for a drive and a walk around the state park at Santa Margarita Lake. It’s unfortunately low on water, causing problems for fishermen and wildlife alike, and the hot-as-hot-gets weather outside didn’t allow us to stumble across any mountain lions or bears. Ha. We did talk to a ranger for a while who was happy to regale us with stories of killer-wildlife run-ins, which we fully expected to have like something out of a cheesy horror movie from the 80s. Even though none of that happened, the tranquility of the lake on that hot summer’s day was good enough for us. Driving even further into the wilderness, we went in search of a couple of old mines and ghost towns. Leery of what the mountains and their four-legged denizens might have had in store for us, we opted not to follow trails we were warned against following in the first place. 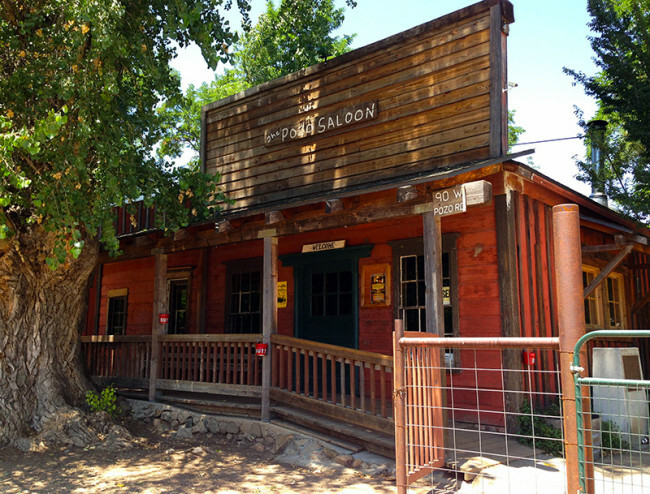 We therefore didn’t stumble across any ruins or remains, and found that the only thing still standing in the former watering hole of Pozo, California, is the famous saloon that now hosts middle-of-nowhere concerts for the likes of people like Willie Nelson. Since the GPS was completely pointless in these parts, we actually drove by it and down the road for another five miles before realizing we had passed it. Circling back around, we stopped to find that the saloon was closed on that particular day and eventually gave up on our quest for Life After People remnants. 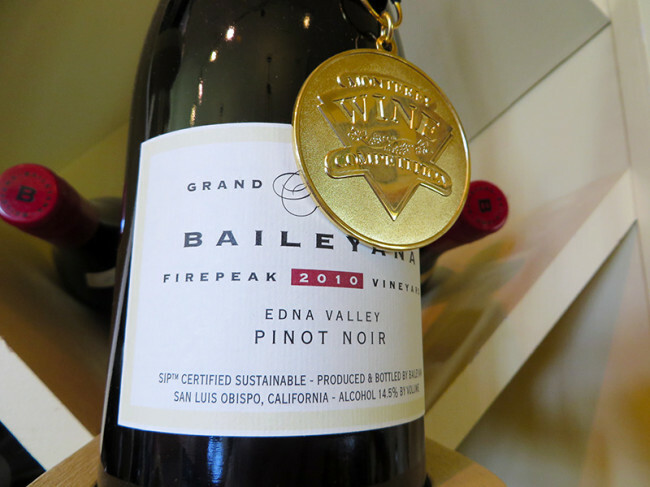 Baileyana Winery and Tasting Room: There is a lush wine-growing region in the Edna Valley just outside of San Luis Obispo, and it was recommended we stop in the Baileyana Winery to throw back a few and hobnob with the more typical of wine fans. 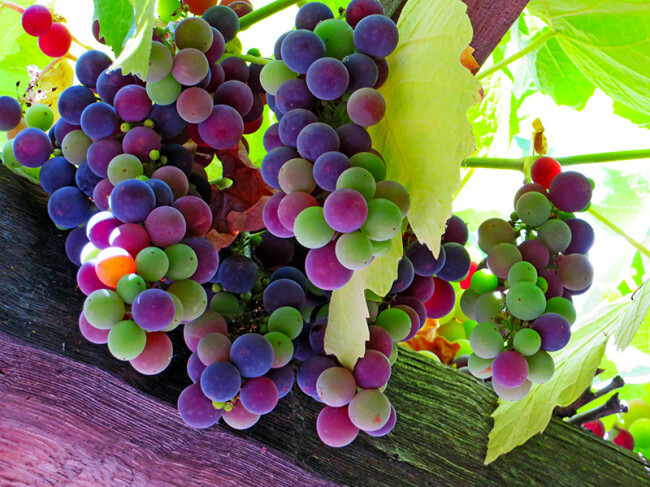 We love a good wine, but you’ll never find us touting one’s hint of some random, regional bush, or a finish of some chocolate that we’ve never had. That puts us at odds with most people who fancy themselves as having an appropriate attitude for a wine tasting. But honestly, Angela and Ryan don’t care. So of course, we went to the winery with the intent of drinking a bunch of the good red stuff and buying gifts for our family. We appreciate that the tasting is only free if you purchase bottles of wine after the fact, which keeps the masses from swooping in all day for free drinks. Not to mention plenty of other non-wine gifts for people in our lives who do not drink. And to top it off, this valley is stunningly gorgeous and not overrun by other fancy-pants wine-making regions in California. 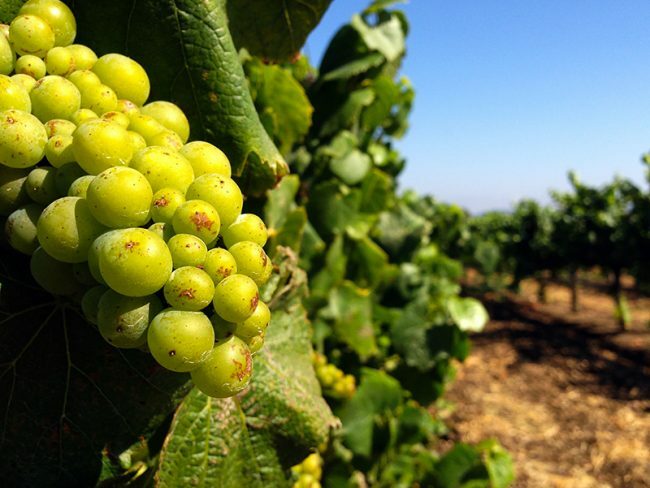 If you’re into this sort of thing, there are quite a few quality vineyards around these parts and we’d suggest you get out and see what they have to offer. 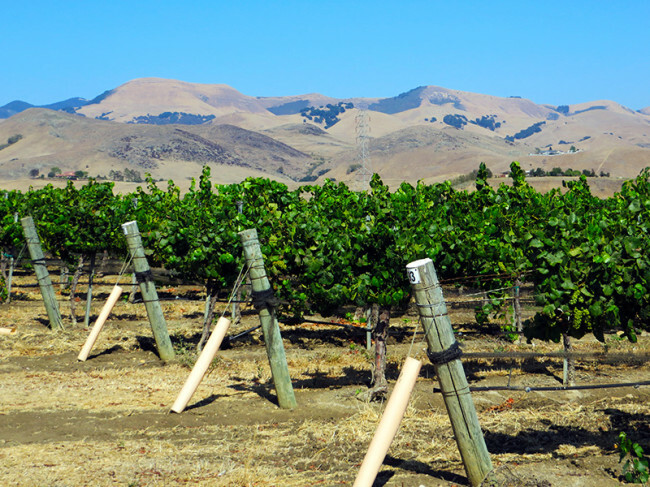 While San Luis Obispo isn’t really a “destination,” it does make for a nice stopover of a couple/few days to take in what the city and the surrounding area have to offer – especially the small towns and vineyards that dot the region. So, why not roll on through and see it for yourself? Want more? Join us on Facebook, Twitter, Instagram, Tumblr, Google+, and Flickr. 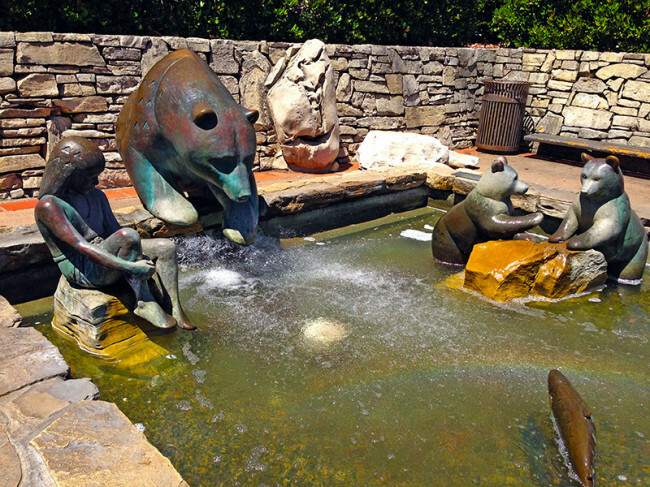 Have you ever been to San Luis Obispo or the surrounding area? Have you visited any of the places in our post? Do you have any suggestions for things people should see when they stay in the region? Any other thoughts? We’d love to hear from you in the comments! I’ve come to have a new appreciation of Motel 6 myself! It literally saved us when we were traveling through Oklahoma during a horrific ice storm. I must have called 10 hotels to see if they were pet friendly only to find the Motel 6 was the only place that allowed two big dogs and charged no extra fees. I expected a smelly room, as often happens when we stay at hotels who say they are pet friendly, but our room didn’t smell at all. 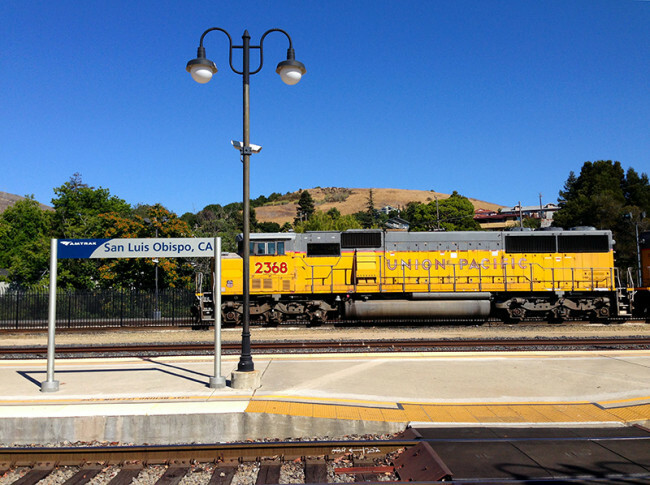 It looks like you found a lot of interesting things to do in San Luis Obispo. 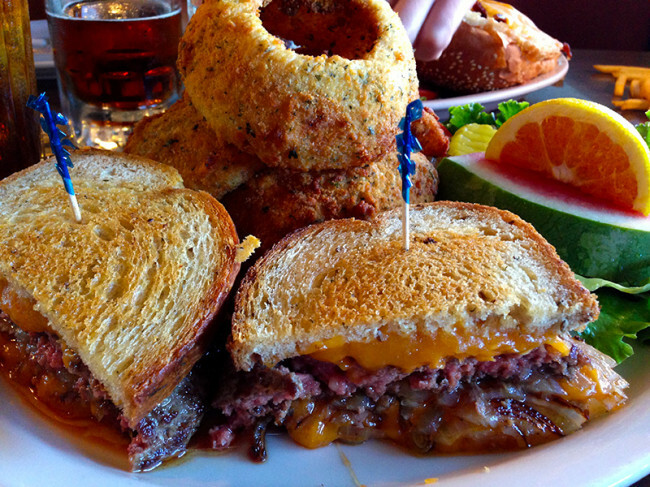 With the exception of the gum wall, everything else looks worthwhile. 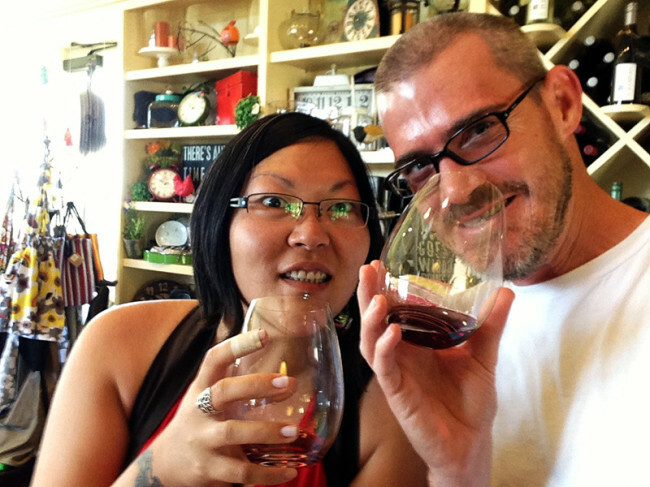 I love wine and Indian food too so Shalimar and Baileyana Winery sound like great places to stop in between the touring. As far as I know, all Motel 6 and Red Roof Inn properties are pet-friendly (and free for pets)…so if you didn’t know that already, you should be covered everywhere with both of those. 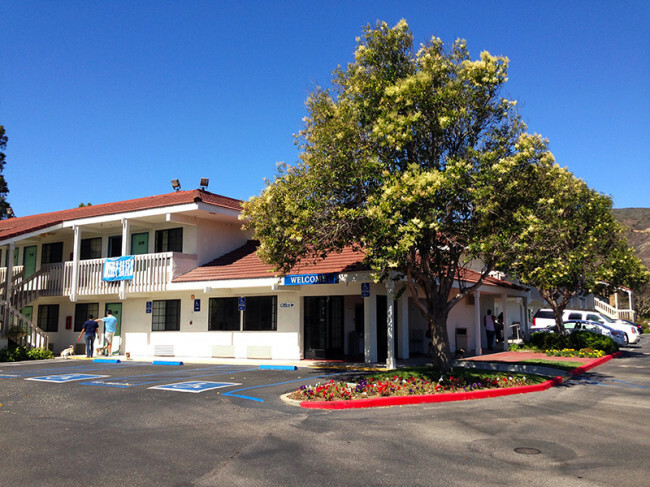 This was definitely not the nicest Motel 6 we stayed in, but it did the job just fine and we had zero issues. Haha, the gum wall was disgusting. SLO is pretty nice and I’m glad we went. I don’t think it’s a real “destination” place, but that doesn’t mean you can’t have a good time there. Thanks for stopping by, Dawn! After just having been on the CA coast and enjoyed the Spanish architecture, I especially liked the beach and architectural pics. Glad you enjoyed it!! Great report and fun read! Several years ago, while still living in the Eastern US, Lisa and I started a Pacific coast trip in SLO. Had a great time. Spent a couple of days, saw a lot of the sites, appreciated the coastal views. We did end up popping for the entry fee for Hearst Castle. Oh the irony. We did pay to see Chateau Versailles when we were in France, but hey, Louis was a king, right? Of course Hearst thought he was, in in the USA maybe the big money/media barons are just that. So maybe it’s exactly appropriate. It is a massive monument to excess, that’s for sure. We ended up at that rail station you showed, and hopped the Amtrak Coast Starlight for points north like Portland and Seattle back on that trip. Contrary to popular opinion, the US does have some trains. Wonder if Amtrak might be into working with travel bloggers like you guys for a Rail Trip of America? They’re semi-government but are commercially marketed and do some promos. I think I’ve even gotten Amtrak points from my Red Lion stays! Though I may be confusing that with getting them from LaQuinta or Hilton. Oh, totally agree with you about blueberry beer! Hey, Mark! Thanks for sharing your story…the thing about it is: At least at Versailles, you can walk around the gardens and aren’t locked out from a half-mile away and forced to pay just to get close. Every time I’ve been there, you could walk the gardens no problem. Maybe that’s changed, though. I want to say that some travel blogger has done a U.S. trip with Amtrak, but I can’t remember who that might have been. And boooo to blueberry beer. At least someone agrees with me; too much stuff that shouldn’t be in beer is getting into it these days haha. Thanks again for stopping by! Hearst Castle was TOTES on Ghost Encounters with that giant Doucheball Zac Bragan! AKA It’s my favorite show, and SLO looks like a pretty sweet place. The Novio wanats to drive the PCH this summer, so my guess is that we will make a stop. Great ideas! I highly recommend the classic PCH drive, for sure. Just don’t leave out Oregon or Washington…Oregon easily rivals what you’ll see in California. Thanks for stopping by, Cat! Glad to see that you found the elephant seals in San Simeon exactly where we left them when we visited the Hearst Castle a few years ago. You’re right that the castle is quite ostentatious, but we found that learning the history behind the castle and viewing the architecture were worth the fee and the drive up. 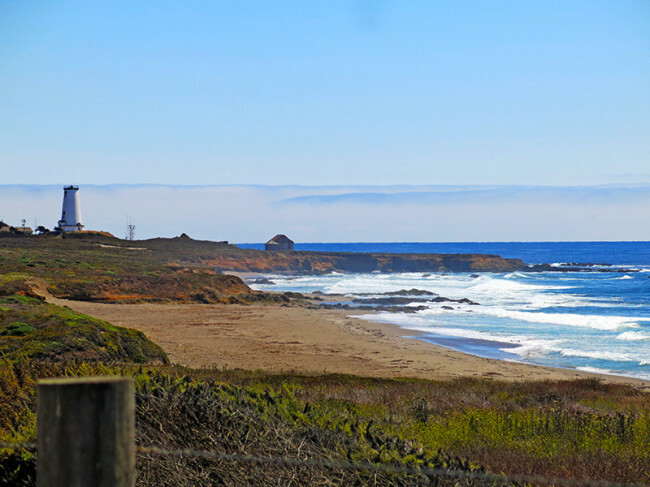 I love this stretch of my state’s coast, and there are lots of cute towns nearby like sleepy, quaint Cambria. Haha yeah, you can’t miss them if you’re gawking like us as you drive down the PCH. I know there’s a great history and it’s an architectural marvel…we just didn’t think it was worth it vs. what else we could be doing with our time/money. So it goes. Thanks for stopping by! 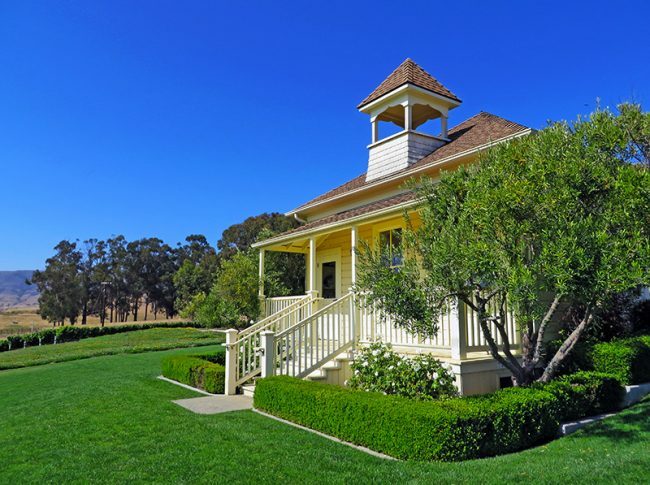 Lovely post about a wonderful part of California. 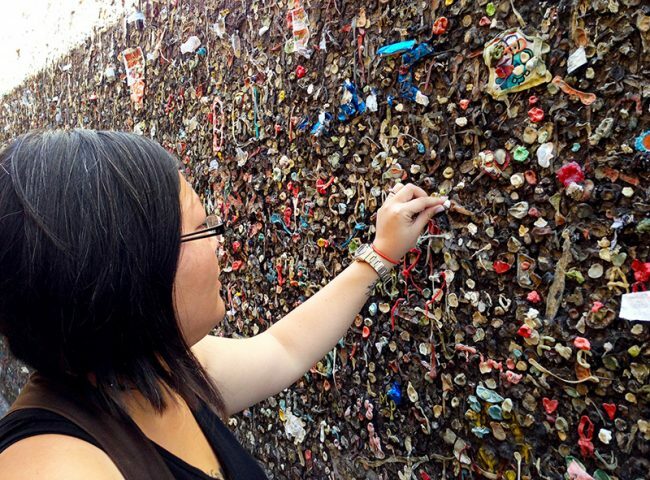 I grew up in the Golden State and I’d never even heard of Bubblegum Alley; obviously I will have to visit soon! I have to disagree with you about Hearst Castle, though. I realize it’s an overpriced monument to wealth and greed, but it is a totally amazing place to tour. It’s a uniquely American version of all those European castles and palaces; the opulence and grandeur are Western rustic, and there are ketchup and mustard jars on the banquet table. Hearst Castle aside, you guys managed to visit an astonishing number and variety of terrific places. Keep up the travels and the reports! And your photos are spectacular! Thanks, Karen! I’m not saying that Hearst Castle isn’t worth it…I’m just saying that we felt our time/money were better spent doing something else. I know it’s an historical icon and supposedly quite breathtaking. Just sayin’. Thanks for stopping by – please send our best to Rich! Totally agree with you about Heasrt Castle, our favorites in the area are Morrow Rock and the elephant seals. Validated! Haha. Have you been there or did you just avoid it like we did? Morro Rock was pretty cool, we unfortunately didn’t make a stop there – just saw it from the road. Thanks for stopping by! I live in Northern California and have been to SLO as well as Hearst Castle (you missed nothing) but it’s been a few years. I have one question – did you have cell service as you drove from Monterey south? I’m searching for a spot left in California without cell service. My husband is hopelessly addicted and can’t unplug. I’m thinking of surprising him with a getaway. Suggestions? Just found your site! Fantastic info, advise, photos, and just plain lots of inspiration to go out and live whatever life you want. Thanks. I live in San Luis Obispo and I totally agree with Angela about needing to take a shower after walking through it. It’s disgusting. 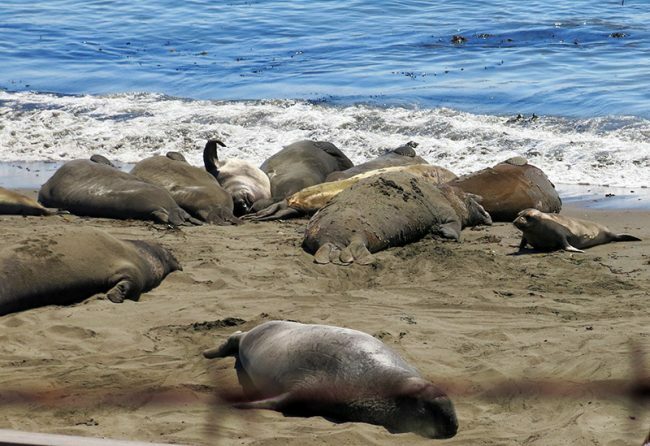 Elephant seals are always big on our list for guests. I’m pretty sure there is no cell service for most of Hwy 1 between the town of Big Sur and Ragged Point, at the south end. Hey Paula, thanks for stopping by and for the kind words! The chewing gum thing haha, yes. Blech. Hope you’re enjoying your summer!